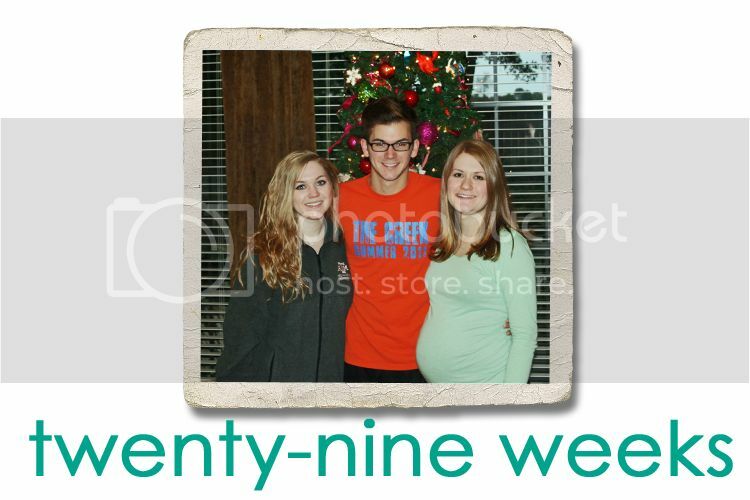 Jordy Liz Blogs: Twenty-nine weeks. Your dad and I celebrated our final Christmas together as just the two of us. It was surreal knowing that the next time we're sitting around a Christmas tree and presents, lighting candles at a Christmas Eve church service and shopping the sales, we'll have a nine-month-old in tow. I'm excited how everything will be so different next year. I also took my final flight pregnant with you. Flying pregnant is pretty uncomfortable, but getting to skip to the front of the security line and getting a little extra attention had its perks. Thankfully, they were short flights and my ribs were relieved in just a couple of hours. We're staying in this city for the next ten or so weeks. You've been moving around a lot more often this week. Instead of quick, subtle movements, I feel your entire body shift around to find a new position. I'm having to get more and more used to it as bending down to put on shoes or leaning over can sometimes be next to impossible depending on where you are. The fact that there are just ten weeks left is pretty surreal. We've got a lot to do to your nursery and we are trying to squeeze in a lot of solid date nights together. Next up: our final New Year's Eve for a while without having to call a babysitter. We're looking forward to meeting you in the new year.